It's estimated that a total of 2.9 Billion search queries are made on Google every day, while on Yahoo it is 663 million and the number goes further low to 136 million with Bing. The results of for our queries on these search engines is shown on the results page which the search engine thinks is the most relevant to our query. With the ease with which one can get internet accessibility and its usage, many websites want their site to be listed among the top so that users consider them to be the most relevant and thus opt for the products listed on that website. This is where SEO or Search Engine Optimization comes in. It can be defined as a method used by SEO companies where they provide the service of increasing the visibility of websites on various search engines. SEO deals with increasing your online rankings when it comes to organic searches that are SEO optimizing does not require you to spend money on increasing your rankings. The website should be optimized in a way that it’s easier for search engines to discover them. Changes to the content structure are made so that for every search query related to the content in your website, your site will have maximum relevance. SEM or Search Engine Marketing can be defined similar to SEO, because of these methods are used to increase the search rankings of a website. The key difference between SEM and SEO is that SEM increases search rankings by paid advertisements. The ads you see on a search engines’ result page is hosted there by the companies who use SEM. You might have seen that these ads seem more relevant to your search queries, this is because search engines also rank these ads by relevance. The most popular platform among search engines is Google AdWords (Google’s SEM platform). While the list contains names as Bing, Yahoo, etc. Usually, these platforms list some websites in of their search results as paid Ads. SEM companies mainly target all kinds of search results, including image, video, academic, news, industry-specific, etc. As discussed before SEO is a tool for increasing the online search rankings of a website. When used properly SEO can give a massive boost to the relevance of a website. When a site is poorly optimized for search engine, it becomes increasingly hard for the search engine to list that website even if the search query is related to the content or services provided by the website. It all starts where Google or any other search engine for that matter rank website regarding usefulness or relevance to the user. It is done so that search engines give the users what they want in the least amount of time without making the users spend more time searching pages on end. So the website with the most relevance is placed at the top position among the search results that you see on the results page. What this does is that websites placed at the top get more traffic than the websites placed at the bottom, even less for the websites shown on the next page. SEO optimization is done so that it increases the relevance of the website. Thus it will be placed in upper half of the search results page and will be able to generate more traffic. SEO depends on the search query that users make. The works we enter into a search engine is broken down into keywords. The relevance of content or a website is determined by the similarity between the entered keyword and the words present in the content. If the keywords you have entered is identical to the works or string of text presenting the website, then the article gets that much more relevance and will be ranked accordingly on the search results page. Search engines read through the entirety of the content on a website to determine its relevance. The keywords present in the content is the deciding factor when it comes to ranking them. Also, a great amount of emphasis is given to original and unique contents. If the content you post is a spin-off version or if it’s highly plagiarized, then the search engines will de-index the site and regard it as irrelevant. That is why the emphasis is given to original content when posting it online, spinning off contents will surely render your website irrelevant. It has been found that about 75% of the internet users won’t go past the first results page while they are searching for something. This means that the having your website ranked in the second or third results page greatly reduces the chance of generating traffic for your website. A well-structured website having original and useful content will greatly boost your SEO ranking. Also, there are some tricks and tips you could employ in your website to give it a massive SEO boost. Therefore if you own a website and need to reach out to people, either to promote or sell, you will have to get your website SEO optimized. 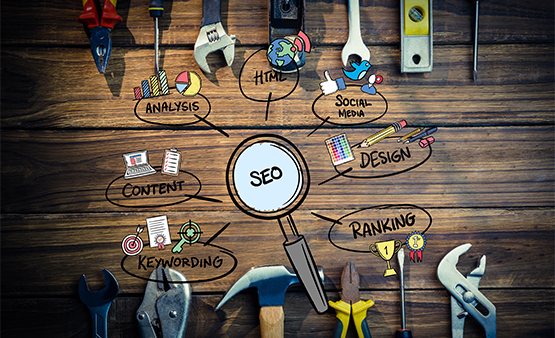 The website might have useful content, but without proper SEO optimization, the chances of the website to generate traffic will be greatly reduced.